Winter Storm Alfred causes destruction in Hartford. This year, a much anticipated Halloween weekend did not go according to plan. While students contemplated whether to go out or not in light of the dismal weather, trees cracked and wires snapped all around Hartford and West Hartford. Those students who dared to venture forth into Hartford for the Halloween party sponsored by the school found that it took over two hours to drive from Hartford’s West End to downtown – and also found that other students hadn’t been so brave as to make the trek. The next day Hartford and West Hartford looked like snowy battlefields. Trees, branches, wires, and leaves left no yard or road unmarked. Cars were damaged. The cage around the tennis courts at Elizabeth Park was torn apart. And worst of all, a large amount of the population had lost power, a real detriment in this dark and cold winter weather. Because it was virtually impossible for students to prepare for school, and also impossible for many other students to get to campus, classes were canceled on Monday and Tuesday. The Law School itself, however, in the midst of surrounding devastation, had retained power, heat, and connectivity. 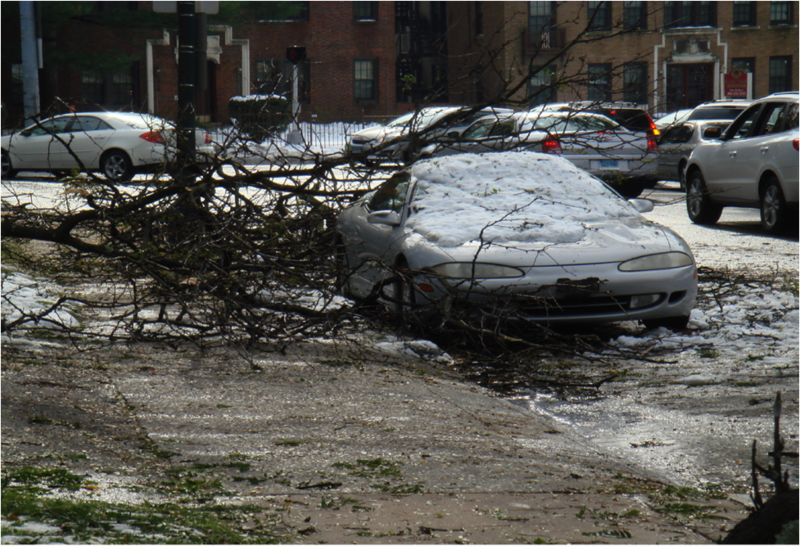 Although there was tree damage on campus, it was minimal compared to the damage only blocks away. Because the school was fortunate enough to have remained in such good shape, the use of its facilities was offered to help alleviate the burdens placed upon the Law School community. The facilities were offered to faculty, staff, students, and their respective families. The damage was so extensive in some areas that the Law School offered people to sleep on campus. About fourteen people took advantage of this opportunity for one or more nights. Thirty people took advantage of pre-paid laundry at WashTub across the street from school, and countless others used the shower located in the basement of Starr Hall. When classes resumed on Wednesday, sessions were recorded for those students who were still unable to come to campus. Dean Crawford sent out numerous emails updating the community and extending an offer of help to those in need. A big special thanks to her! One student reported that he did not lose power and was able to endure the storm comfortably in his apartment located two blocks from the school. He reported, however, that as an out-of-state 1L without family in the area, he felt comforted by the fact that had he encountered difficulties, he could have easily walked to school where he “would have been welcomed by people who were doing everything in their power to make us feel safe and comfortable.” He could’ve taken a hot shower, eaten warm food, sought refuge from the cold, and done laundry at no charge. His sentiment of, “Thanks to the kind efforts of the staff at UConn Law, I certainly felt a little bit more at home,” is echoed by the entire UConn Law community and Pro Se. Matt Grimes, a 4L evening student, won a seat on Brookfield’s Zoning Commission in November’s local elections. Grimes, who ran as a Republican, came in first out of five candidates in the race, securing one of the two available Zoning Commission seats. Currently working full-time as a bond claim manager at The Hartford, Grimes has a formidable history of town government service. After graduating from the University of Richmond in 2001, Grimes became a member of the Brookfield Board of Education while working for AIG in New York City. He eventually be became the Board’s Chairman, in which he served from 2003 to 2005. At the time, Grimes was the youngest Board of Education Chairman in the United States at age 24. Grimes worked for a time as the Chief of Staff to the First Selectman of Bethel. In 2008, Brookfield’s Board of Selectmen nominated Grimes to fill an open alternate spot on the town’s Zoning Commission. Grimes had no formal experience with zoning issues, but his grandfather had been the Chairman of the Planning Commission and his father worked in the construction industry, and he saw it as an opportunity to serve his town. “When I got on Zoning, I had no clue about land use. I just had a law student background…but I knew how town government worked,” he said. After serving as an alternate on the Zoning Commission for several years, the town Republican caucus nominated Grimes to run for an open regular member seat in the November election. Grimes spent the ensuing months campaigning on the Republican slate with sixteen other candidates for town offices, attending various town events and writing position papers for local newspapers. Grimes said constituents’ main concerns when voting for Zoning Commission members is that they will be treated fairly when they come in front of the commission. His November win secured him a four-year term on the Zoning Commission where he will help ensure that all new building plans fall within zoning regulations. Grimes said his legal education has helped him on everything from understanding zoning case law to interpreting the regulations. “I’m definitely a different commission member than I would have been had I not gone to law school,” he said. Brookfield Zoning Commission Chairman, Bill Mercer, is also a UConn Law graduate, as are many of the attorneys who come before the Zoning Commission. Grimes said town government work, especially zoning, is perfect for those who want to get involved in their towns, but don’t have a lot of time to commit. “Land use is such an important function of town governments. And it’s very easy to learn,” he said. The H-1B program extends visas to foreign workers for occupations requiring theoretical or technical expertise. A major portion of the H-1B population consists of foreign students who graduated from U.S. higher education institutions and are subsequently being employed in the U.S. The weakening economic conditions have resulted in many H-1B employees being laid off or terminated, thus, facing imminent departures to their home countries. Title VII of the Civil Rights Act of 1964 prohibits employment discrimination based on race and national origin, but its application to H1B Employees may not be consistent. The “dual-intent” exception in the Immigration Act of 1990, which established the main features of the H-1B visa program, has been used as a vehicle by many foreign students to obtain employment-based legal permanent residency or green card. U.S. colleges and universities enroll over half a million foreign students annually, according to the U.S. Dept. of Education. The U.S. employers are at risk of losing this well-trained workforce to its foreign competitors. Over the past few years the attractiveness of the H-1B program, which was designed to bolster U.S. expertise in science and engineering, has been fading. According to U.S. Citizens and Immigration Services, in April 2011 it received about 8,000 H-1B petitions from businesses, the first month the agency accepts them for the fiscal year beginning Oct. 1. That compares with 16,500 petitions in April 2010 and about 45,000 in April 2009. Connected to this decline may be the exploitation of these workers in the U.S..
An H-1B employee’s right to stay in the U.S. is tied to his employment. The moment such employee is terminated his employer revokes the Labor Condition Application (LCA); therefore, the employee must immediately return to his home country—there is no grace period. When such employee loses the job, he becomes an illegal immigrant who lacks legal standing. Once he leaves the U.S., he is no longer subject to jurisdiction of the U.S. courts, and for all practical purposes, he will not be able to pursue a civil rights lawsuit. Exploitation of this legal loophole is unavoidable—some employers “bench” H-1B employees for months without pay; some head-hunter, executive hiring or consulting firms keep these employees in their payrolls without pay until they can place them in a job. Once the person is recruited, the firm charges a hefty percentage of the employee’s salary for a specific period of time. An aggrieved employee can wage complaints to the U.S. Department of Labor by filing a form WH4. In many cases, when a WH4 investigation is ensued, the employer terminates the employee, and revokes the LCA retrospectively, despite it being illegal to do so. Consequently, the employee becomes an illegal immigrant subject to deportation, which also jeopardizes his re-entry to the U.S. Thus, an illegal termination of an H-1B employee causes irreparable harm that prevents him from seeking remedy under Title VII. A recent case may promise a remedy. In Karakozova v. University of Pittsburgh, the plaintiff was employed as a Research Assistant on H-1B visa and had a contract to work in her current position until June 14, 2009. On January 23, her supervisor sent her a letter stating that her contract would end on June 14 due to insufficient funding. As a result, plaintiff’s visa would expire on June 14, requiring her to return to Russia. Plaintiff argued that she was subjected to discrimination on the basis of national origin, in that her supervisor decided not to renew her contract because of alleged insufficient funding, yet hired and/or retained other similarly situated persons of Korean descent. Granting a preliminary injunction, the 3rd Circuit Court stayed the case while plaintiff pursued her claims before the Equal Employment Opportunity Commission, the Pennsylvania Human Relations Commission and through the University grievance appeal processes. In the interim, respondent was ordered to maintain plaintiff’s employment with equal salary and benefits. The H-1B employees are a skilled, hard-working and ambitious workforce. Like most immigrants, they thrive on the aspiration to become successful in the U.S. Unfortunately, for all practical purposes, these employees seem to be miss out on one of the most progressive legislations in the U.S. history—the Civil Rights Act. Chris Potts presented along with Janie Crocco and Kristin MacDougall at CJIL’s New Voices Panel. While Hartford was being hammered by a snowstorm, CJIL Members were heating up London with discussions on timely international legal topics. The Connecticut Journal of International Law, represented by seven respected members, traveled to London to attend a UConn Law School international alumni event. On Saturday morning, the Journal hosted its first ever New Legal Voices panel, an interactive presentation concerning a range of international topics. Journal members Chris Potts, Janie Crocco, and Kristin MacDougall presented their note topics to an audience comprised of professors and students from around the world, seeking commentary and criticism. Brendan Kelley, who was unable to present due to a lack of time, also prepared written discourse on debit fees. Potts opened the panel with his presentation of the Patent Prosecution Highway (PPH) and the effect that it will have on the validity of patents issued through the process. One of the questions he presented for scrutiny was the quality of patent examiners throughout the PPH and whether the process would result in an increase in improvidently granted patents. Crocco presented about a gap in the International Convention on Child Abduction framework, pertaining specifically to cases in which domestic violence is an issue. She engaged in a discussion with the various scholars about the extent to which the U.S. legal system has mechanisms in place to address this gap. Dr. Michael Addo, a highly esteemed senior lecturer, from the University of Exeter, spoke about the merits of a framework such as the one provided by the European Convention on Human Rights for addressing issues such as this one. MacDougall analyzed the differences between Zimbabwe and Kenya’s strategies for promoting or failing to promote tribal rights. She introduced a new theory for why these two countries behave so differently based on the historical development of the countries. Dr. Addo, an established specialist in human rights law who had prepared a brief response to MacDougal’s note, found a great deal of merit in her analysis and presented questions for further research. The presenters demonstrated a well-researched and thorough understanding of their respective topics, the discourse was lively (the event ran considerably over schedule), and the commentary was insightful. UConn Faculty proclaimed this event a great success and insisted that the journal continue the tradition stateside. You can look forward to seeing the American adaptation of New Legal Voices panel next spring. On November 11th and 12th, the Insurance Law Center, Connecticut Insurance Law Journal, and Connecticut Law Review presented a joint symposium on the legal and policy implications of health care reform and the Affordable Care Act (ACA). Pro Se sat down with UConn Law’s own Professor Stephen Utz, who presented on the tax policy considerations of the ACA, to discuss his impressions of his panel and the topic in general. Professor Utz remarked that fellow panelists Professors Ted Ruger (University of Pennsylvania) and Rex Santerre (University of Connecticut School of Business) presented an overview of the “tough reality” implications of ACA. They reported that the cost containment measures do not seem realistic. The lack of coordination between various areas of the medical field creates inefficiency in the U.S. healthcare system. During the discussion “the Mayo Clinic was held out an ideal” for how health care should operate. It follows an integrated care model for its patients, in which the doctors collaborate over patient treatment. Rather than having doctors re-order the same tests and examinations as the patient works his way through the treatment process, the doctors focus on coordinating the treatment and providing seamless integration of all levels of care. While this integrated model certainly works well for Mayo, the principle underlying such treatment may not accord well with the U.S. conceptions of health care: “We see that as rationing health care.” Additionally, Professor Santerre explained during the panel that “it took decades for them [the Mayo Clinic doctors] to create the systems of trust that allowed them to integrate professionally.” The majority of health care providers practice defensive medicine, contrary to this collaborative method. 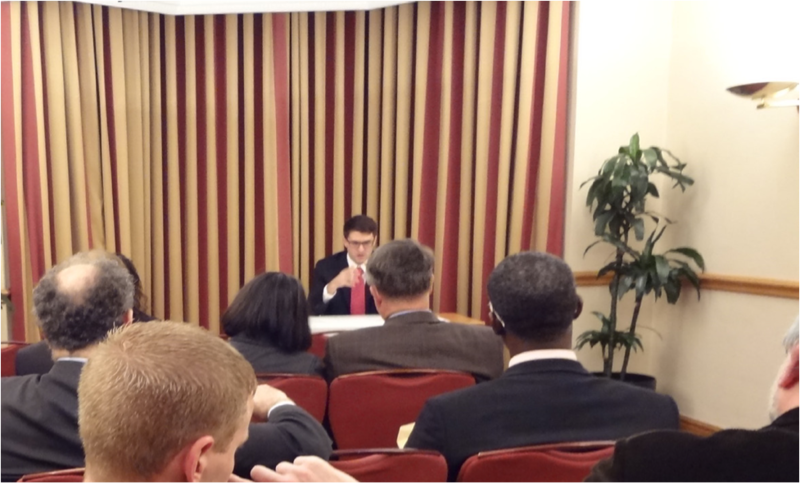 Professor Utz himself spoke on the interaction of the ACA with tax policy. He noted that one of the goals of our present system is to untangle individual health care payments and government benefits from the tax base, but that ACA only partly accomplishes that goal. “The ACA continues to exclude self-employed self-provided health insurance and large employer-provided heath care coverage from income, which accords with this goal, but it also continues to tax some or all of what employees without employer-provided health care pay for their coverage, while imposing a mandate that everyone buy insurance.” By continuing to apply exclusions, deductions, and credits unequally, ACA perpetuates inequality inherent in the current tax system. In addition to the panel on the tax and economic considerations, the symposium included an examination of many of the controversies that have arisen as a result of ACA’s enactment as well as scrutiny of the different provisions of the Act itself including issues states face in implementing the Act, disparities in access to health care, and constitutional concerns. Overall, Professor Utz concluded that listeners sitting in on any of the panels would emerge with an improved understanding of the problems facing health care reform.